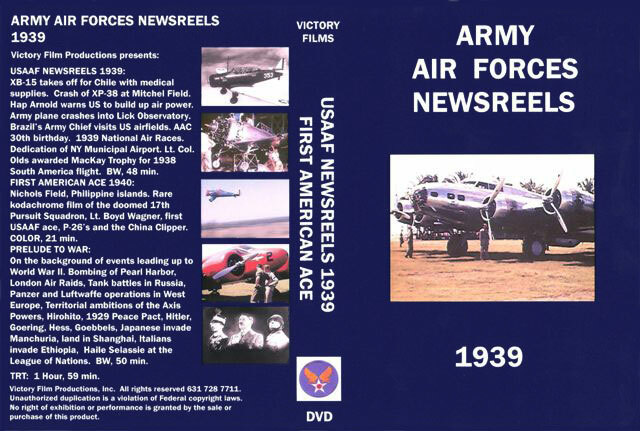 “Army Air Forces Newsreels -1939"
Advantages: Great footage, including color sequences; terrific inspiration for modellers. Reviewed by Floyd S. Werner Jr. The last year of peace before the outbreak was punctuated by the fluffing of feathers by the US. The Army Air Force in particular needed the public to believe that the massive build up of men and machines was needed. Enter the newsreel. In the days before TV and the internet the American public got their news from the radio and the talkies at the matinee. These newsreels were the truth as published by the government and always had a purpose to support the cause. This DVD contains numerous newsreels and is broken down into three chapters. This trip down memory lane starts out with the massive XB-15 deploying to Chile with medical supplies. The XB-15 is a huge airplane and in its natural metal finish it is truly a marvel. Training airplanes are the order of the day and we are treated to massive formations in the air and on the ground. These formations are truly inspiring. Interesting to me are some attack planes/dive bombers that I couldn’t identify, but looked like predecessors of the Vindicator. In the same newsreel is the “unidentified” twin boomed airplane (P-38) that just set the coast to coast record. This airplane made by Lockheed crashes on short final. Not the way you want to end the trip. It sure is shiny though. Another aircraft that you see in this short is the B-18. One thing that is readily apparent is the race to arm the air corps. P-36s taking off from Langley Field are colorful and painfully slow. The B-17s that are shown are very early models and it is nice to see them flying, all shiny and polished. More B-18s and B-17s are shown at the opening of Sacramento AAF. P-35s and P-36s on maneuvers in Michigan show that the AAF was nowhere near being ready for combat but the newsreels do their best to show the strength and fortitude. There is a strange sequence showing the XB-15 delivering a casket of a Mexican aviator back to Mexico. The huge crowds and the whole situation are surreal with crowds rushing the airplane and the melee that follows as they attack the crew and other Americans. There seems to be accusations of sabotage. Visiting dignitaries and flyovers are the highlight of many of the newsreel. Airplanes doing the flyovers are impressive. The early B-17s at low level and in formation is nice. P-26s, one of my favorite airplanes, is seen in formation over New York City. Amazing how things changed both in aviation and construction. There are plenty of newsreels dealing with the 30th anniversary of the Army aviation. Some of them show the historic aircraft and people such as the early Wright Flyers and Eddie Rickenbacher. In what might have been the earliest RC model airplane, a model is used for target practice. It is interesting in the early plane is controlled by a rotor dial like an old phone of the period. Flyovers of really colorful (ok they are in black and white) P-36s will motivate modelers. It is nice to see the real thing doing what they did best. Roscoe Turner is shown winning the 1936 Air Races. OK now there are lots of things on this DVD that you don’t see everyday. Enter the Aircuda. First of all it isn’t a very pretty airplane and there just ain’t a lot out there on them, but you get to see this baby fly. It isn’t as ugly in the air and actually pretty nice looking. How about a P-37? Long and sleek and shiny as chrome. This part of the DVD is full color and not technically a 1939 feature. It is actually a 1941. 17th Pursuit Squadron America’s First Ace Dwight “Buzz” Wagner. San Francisco to Manila and full color. Loading up the ship with items for the defense of the Philippines it is interesting to see the clothing and the cars of the period as they actually appeared. The Golden Gate is impressive. Upon arrival in Manila we are treated to full color shots of Catalinas with bright yellow wings and silver skin. P-26s lined up on the airfield alongside some Swedish redirected P-35s. The P-35s are seen without the wings and with a lot of panels removed. Beautiful take off shots of the P-26s taking off with their blue fuselages, yellow wings and red cowl rings. It is even nicer with in flight shots. The P-35s are unique in having red, white and blue tails and Swiss markings on the wings and fuselage. Sikorsky S-43 seaplane is shown loading up. Pan Am Clipper docking is just like being there. I’m amazed at the clarity and the color, which is perfect. The P-35s take on a new look with the Olive Drab and Neutral Grey. These home movies are just glorious in their representation of life in the Philippines in 1941. A beautiful B-17D lands at the field in all of its aluminum glory. Prelude to War is the third chapter on the DVD. Filmed in black and white is a typical Frank Capra production. This is the best version I have seen of this newsreel which was required viewing for the soldiers, sailors and marines. Germany, Italy and Japan are all included and why they are bad and evil. It deals with isolationism and the inter-war year. One thing that is readily apparent from these newsreels is that America was not ready to go to war in 1939, nor would it be ready for awhile. The quality of this film and the others in the Victory Films library are well worth the money. The historical significance cannot be understated. http://wademeyersart.tripod.com/id73.html . Tell him you heard about it here. Thanks to Victory Films for the review copy. Review Copyright © 2007 by Floyd S. Werner Jr.